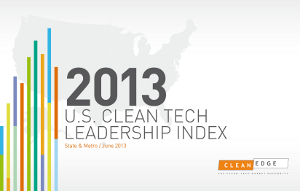 Today Clean Edge released the U.S. Clean Tech Leadership Index. Below is a copy of the official press release. You can also download the Index report here. Please contact me if you’d like to discuss the Index, if you would like to receive print-ready artwork for your coverage, of if you have any questions. Managing Director, Clean Edge Inc.
Portland, Ore., June 4, 2013 – Clean Edge, the world’s first research and advisory firm devoted to the clean-tech sector, today released its inaugural U.S. Clean Tech Leadership Index report featuring extensive data from the firm’s State Index (fourth annual edition) and Metro Index (second annual edition). The report can be downloaded for free at www.cleanedge.com. This year’s Index shows that leadership in clean tech at the state and metro levels is inextricably linked. Half of this year’s top 10 metro areas are located in California – the State Index leader for the past four years. Four other metro areas are located in the top 10 states of Massachusetts, Oregon, Colorado, and Washington. The only exception among the top 10 metro areas is America’s unique “city without a state,” the nation’s capital of Washington, D.C., which ranks fifth in our 2013 Metro Index. The State Index is comprised of nearly 70 indicators contained in the three major categories of Technology, Policy, and Capital. The Metro Index includes more than 20 indicators within the categories of Green Buildings, Advanced Transportation, Clean Electricity & Carbon Management, and Clean Tech Investment, Innovation, & Workforce. The release of the 50-page report represents the first time Clean Edge has made available a comprehensive public report with state and metro-level scores and rankings beyond its subscriber base. Sponsors of the 2013 U.S. Clean Tech Leadership Index include lead partners The Energy Foundation and Wells Fargo and supporting partners APCO Worldwide, Environmental Entrepreneurs, the City of Houston, the Massachusetts Clean Energy Center, SolarCity, and the Portland Development Commission. In addition to publicly available datasets and Clean Edge-derived indicators, Clean Edge leverages data from private data partners including Cleantech Group, Heslin Rothenberg Farley & Mesiti P.C., InnovateTech Ventures, Interstate Renewable Energy Council, and R.L. Polk & Co. In addition to the public report, complete state and metro datasets, along with advisory hours, are available to Index subscribers. For information on subscription packages contact Bryce Yonker, Clean Edge Director of Business Development at 503-206-8448 or [email protected]. Clean Edge, Inc., founded in 2000, is the world’s first research and advisory firm devoted to the clean-tech sector. Clean Edge managing director Ron Pernick and senior editor Clint Wilder released their latest book, Clean Tech Nation(HarperCollins) in September 2012, offering a bipartisan Seven-Point Action Plan for Repowering America (www.cleantechnation.com). For more than a decade the firm has delivered timely data, expert analysis and comprehensive insights to governments, corporations, investors, foundations, and nonprofits. The company offers an unparalleled suite of index, benchmarking, and advisory services including the U.S. Clean Tech Leadership Index, sponsored publications including the annual Clean Energy Trends report, and benchmark clean-tech stock indexes with NASDAQ®. To keep abreast of the latest clean-tech trends or learn more about our services, visit www.cleanedge.com.